Content is King - go and check your Business Website pages now! - The story of AB Publish - From Start to end! Ok - we have all heard this many times. 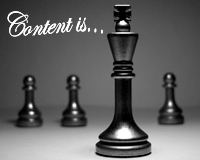 But there is another aspect to Content is King which you must get right if you want to keep your visitors interested. And interested visitors are more likely to turn into customers. People use Browsers to navigate the Internet! Before you switch off, turn round or even worse, click on a competing website, hear me out. I know this is not a secret, but there is a secret within this sentence! How do people read the Content of a Business Website? People do not read Internet Sites like a book, they browse them. Interesting and captivating Internet Pages are more like brochure pages or document summaries. The salient points must be easy to find. Visitors decide within the first 3 seconds whether your Internet Page is useful to them or not! I believe one of the most important aspects about the content of Business Websites is the presentation. Yes the text is important. But great text poorly presented will result in your visitors going elsewhere. Write for people who skim. Place the most important points at the top of the page where the visitor can decide if he is interested or not. The AB Publish Business Website Creation System offers an easy, intuitive control panel. Use this to provide great content…but do not forget that great content must include great presentation. If you do, then your Business Website will really contain kingly content!